Smoking fish is not difficult, and it takes far less time than smoking meats such as pork or venison. You will need large pieces of your fish—salmon is an excellent smoking fish as are bluefish, shad, trout, mackerel, or sturgeon—and then you will need to prepare a brine. Mix together all the brine ingredients and place your fish in a non-reactive container (plastic or glass), cover, and put in the refrigerator. The fish will need to cure for several hours. This curing process eliminates some of the moisture from the fish, and at the same time infuses it with salt, which will help preserve the fish. The curing process takes at least 8 hours, even for thin fillets. You should plan on at least a day for a thick fillet such as salmon. For sturgeon steaks or something even thicker, consider curing for long as two days. Be careful to not overdo it. Your fish is essentially being pickled and brined in this solution, so the longer you keep it submerged in the brine, the saltier it will get. Under no circumstances should you brine for more than three days, that will leave you with some seriously salty fish. Air drying is one step many beginning smokers fail to do. Drying your cured, brined fish in a cool, breezy place is vital to properly smoke it. You need to form what is called a pellicle, which is a thin, lacquer-like layer on top of the fish that seals it and creates a sticky surface for the smoke to adhere to. You can achieve this by resting the brined fish on a rack and putting it in a cool place (less than 65 degrees) that has good air circulation. You also can run a fan over the fish at low speed. Let the fish dry this way for at least two hours, and up to three. The salt in the brine will protect your fish. Once your fish develops a pellicle, you are ready to smoke your fish. The method used here is known is hot smoking, as opposed to cold-smoking (smoked at temperatures below 80 F). Cold smoke does not actually cook the fish, so it is left with an almost raw-like texture. That is typically what you find in the flat, vacuum-sealed refrigerated packs at the grocery store. 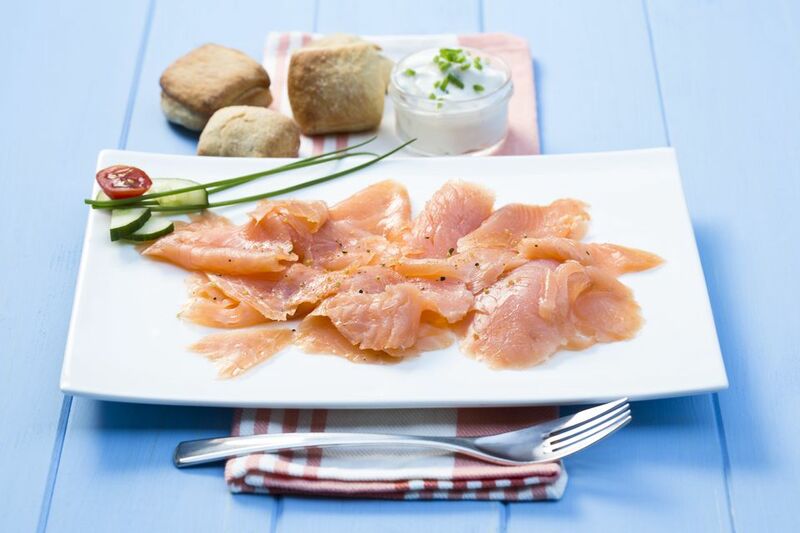 A hot-smoked fish will be preserved better than a fresh fish, but it will still spoil faster than a cold-smoked fish. Hot smoking does not mean high temperatures. Ideally, you should smoke your fish at around 140 F. The smoking box rarely spends more than 30 minutes at that temperature, however; it rises throughout the smoking process. As for the right woods for hot smoking fish, almost anything goes, except for treated wood and pine, which contains resins that will make your fish taste bitter. The most common kinds of wood for smoking fish are alder, hickory, oak, or​ apple or any other fruit or nut wood. You will want to smoke your fish about an hour for thin fillets and as long as four hours for big slabs of sturgeon or tuna belly. You are aiming for an internal temperature of 140 degrees, which is usually when the meat flakes easily. Once the fish is smoked, you can keep it wrapped in the fridge for 10 days, or freeze it for up to 6 months. If you have access to a vacuum sealer, vacuum seal it for prolonged storage.